Flexible module for candidates joining classroom or online test. Evaluation will be done in two weeks’ time. Experts will evaluate answer sheets only (Elite IAS Team). Systematic guidance for the development of a multi-dimensional approach in essay writing. Expert Support: Telephonic Discussion/E-mail Interaction. Model Answers (synopsis) will be provided for all 06 papers of the test series. Copy evaluation and feedback system are designed to provide relevant insights and feedback to each candidate as per his/her performance. Nature of questions will be as per UPSC pattern. Flexi-module helps aspirants to accommodate with the social environment and focus on their preparation for Civil Services Exam. Such as working professional, college students, coaching attending students etc. 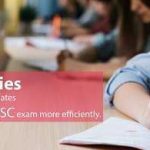 Nowadays, writing test series is almost essential and it would be rational decision to EVALUATE YOURSELF BEFORE THE UPSC EVALUATES YOU.